For the ancient Maya site known as Chetumal, see Santa Rita Corozal. Chetumal (Spanish pronunciation: [tʃetuˈmal] ( listen) Modern Maya: Chactemàal pronounced [tɕʰaktʰe̞mɐː˨˩l], "Place of the Red Wood") (coordinates: 18°30′13″N 88°18′19″W﻿ / ﻿18.50361°N 88.30528°W﻿ / 18.50361; -88.30528) is a city on the east coast of the Yucatán Peninsula in Mexico. It is the capital of the state of Quintana Roo and the municipal seat of the Municipality of Othón P. Blanco. In 2010 it had a population of 151,243 people. The city is situated on the western side of Chetumal Bay, near the mouth of the Río Hondo. Chetumal is an important port for the region and operates as Mexico's main trading gateway with the neighboring country of Belize. Goods are transported via a road connecting Chetumal with Belize City to the south, and also via coastal merchant ships. There is a commercial airport, Chetumal International Airport, with airline service. Because of its location on the Caribbean coastline, it is vulnerable to tropical cyclones; Hurricane Janet and Hurricane Dean, both Category 5 storms, made landfall near Chetumal in 1955 and 2007 respectively. Chetumal has become known for its traditional wood buildings, few of which survive. In Pre-Columbian times, a city called Chactemal (sometimes rendered as "Chetumal" in early European sources), probably today's Santa Rita in Belize, was the capital of a Maya state of the same name that roughly controlled the southern quarter of modern Quintana Roo and the northeast portion of Belize. This original Chetumal is now believed to have been on the other side of the Río Hondo, in modern Belize, not at the site of modern Chetumal. During the Spanish conquest of Yucatán, the Maya state of Chetumal fought off several Spanish expeditions before finally being subjugated in the late 16th century. The 1840s revolt of the indigenous Maya peoples against Mexican rule, known as the Caste War of Yucatán, drove all the Hispanic people from this region; many settled in Corozal Town, British Honduras (modern Belize). The current site of Chetumal was established as a Mexican port town in 1898, originally under the name Payo Obispo. 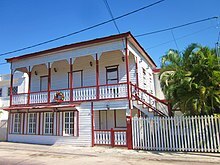 At the invitation of founder Othon P. Blanco, the early town was populated by settlers from Belize (including Caste War refugees and Englishmen). The name of the town was officially changed to Chetumal in 1936. Two hurricanes in the 1940s leveled the entire town; Chetumal was devastated a third time in 1955 by Hurricane Janet. After this, the town was rebuilt with more solid construction, with concrete blocks replacing wood as the usual material. The population of Chetumal was small (about 5,000 in 1950) until the construction of highways linking it to the rest of Mexico in the 1960s and 1970s; the city then boomed with substantial migration from other parts of Mexico. Chetumal is a growing city with an international airport. The city has a Museum of Maya Culture as well as a zoo, the Payo Obispo Zoo, which belongs to the children of Quintana Roo. Chetumal's economy has been influenced by its proximity to the border with Belize. A goods and services tax-free zone (Corozal Free Zone) established on the Belizean side attracts many visitors to Chetumal and also provides a ready market for Chetumal's retailers and traders. However a certain vacuum was created by the lower free zone prices forcing many Chetumal retailers to close their doors. Merchandise bought elsewhere was hard to sell at higher prices than the competition. Chetumal itself was also once a free zone and a notable destination for people from other parts of Mexico seeking to purchase high-value and bulk goods, free of government duty charges (a policy that was deliberately implemented to attract this business). The city retains a significant retail trade for the region, which supports many local businesses. A large indoor mall, the Plaza de las Américas, houses a modern movie theater (which belongs to the Mexican chain Cinepolis), various department store chains, fast-food outlets, and a Chedraui supermarket. In addition to its retail economy, Chetumal is also the capital of the state of Quintana Roo. Since it is the location of all of the state's central offices, there is a large population of government employees whose consumption of local goods and services injects additional revenue into the Chetumal economy. As Capital of the state, Chetumal receives a good share of the foreign currencies brought in by the considerable floating population composed of European, Asian and North American tourists. The city has a music school which offers lessons of various instruments as well as music theory and history. The school is the main music school of the state and is the home of the Junior symphonic orchestra of the state Quintana Roo ("Orquesta sinfonica juvenil del estado de Quintana Roo") which is directed by Silvia Alcantara Chavero. The city houses two theaters. The "Teatro Minerva", which is an open-air theater and belongs to the state's music school, and the "Teatro Constituyentes", which is a private-owned theater. There is a Country club, which features tennis, football and basketball courts, a gym, a swimming pool, a steam-bath and a lounge for parties. In the early 1990s, the University of Quintana Roo was established at Chetumal, providing training and advanced tertiary degrees over a range of subjects. Cultural Center of the Fine Arts (Centro Cultural de las Bellas Artes), located in the center of the city. The building is housed in what was the school Belisario Domínguez, which was the first school of Quintana Roo. Museum of the Mayan Culture (Museo de la Cultura Maya), considered the largest and most comprehensive museum in the state dedicated to the Mayan culture. It has an important collection of authentic and reproductions of classical works, and tells the development of Mayan culture, its origins, as well as various aspects of their daily life. Museum of the City. Tied to the Cultural Center of the Fine Arts, dedicated to the exhibition of photographs, tools and documents that tell the story of the founding of the city. Monument to the Flag (Monumento a la Bandera), the first monument built in Chetumal. It consists of a white obelisk that has a clock dial on each of its faces. Cradles of the Meztizaje (Monumento Cuna del Meztizaje), constructed in the entrance of Chetumal. It has the form of a Mayan pyramid on which are the statues of Gonzalo Guerrero, his wife Zazil Há and the children of both. Andrés Quintana Roo Memorial, dedicated to Andrés Quintana Roo, whom the state was named after. Monument to the Fishermen, one of the most recent, located in the Bay of Chetumal. ^ Carrillo, Manuel. Dean pummels Mexican resorts[permanent dead link], Reuters Canada, 2007-08-21. Accessed 2007-08-21. ^ Belize Tourist Board. "Santa Rita". The Belize Virtual Guide. Naturalight Productions Ltd. Archived from the original on 30 September 2011. Retrieved 14 August 2011. ^ Association for Belizean Archaeology (1989). Foster, Byron (ed.). Warlords and maize men: a guide to the Maya sites of Belize. Cubola Productions. ISBN 978-968-6233-06-3. ^ Rider, Nick (2005). Yucatan and Mayan Mexico. New Holland Publishers. ISBN 9781860112119. Retrieved 27 March 2018. ^ "Estado de Quintana Roo–Estacion: Chetumal (DGE)". Normales climatológicas 1951-2010 (in Spanish). Comision Nacional Del Agua. 2012. Archived from the original on 3 March 2016. Retrieved 7 May 2015. ^ "Extreme Temperatures and Precipitation for Chetumal 1953–2009" (in Spanish). Servicio Meteorológico Nacional. Archived from the original on 18 May 2015. Retrieved 7 May 2015. ^ "NORMALES CLIMATOLÓGICAS 1981–2000" (PDF) (in Spanish). Servicio Meteorológico Nacional. Archived from the original (PDF) on 25 April 2015. Retrieved 7 May 2015. ^ "Station 76750 Chetumal, Q.R." Global station data 1961–1990—Sunshine Duration. Deutscher Wetterdienst. Retrieved 7 May 2015.